Just a quick catch up with what I have been watching over the holiday break. 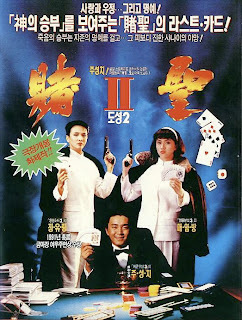 The sequel to Pang Ho-Cheung's original is good fun in places with some genuinely funny moments, but is ultimately disappointing, lacking the wit, invention and heart of the first film, replacing these with broader and more coarse humour and questionable taste in some scenes. It does however have some nice performances, particularly Josie Ho who was very good and Jordan Chan was very solid again. Extra points too for some nice Election references and Sandra Ng's cameo. 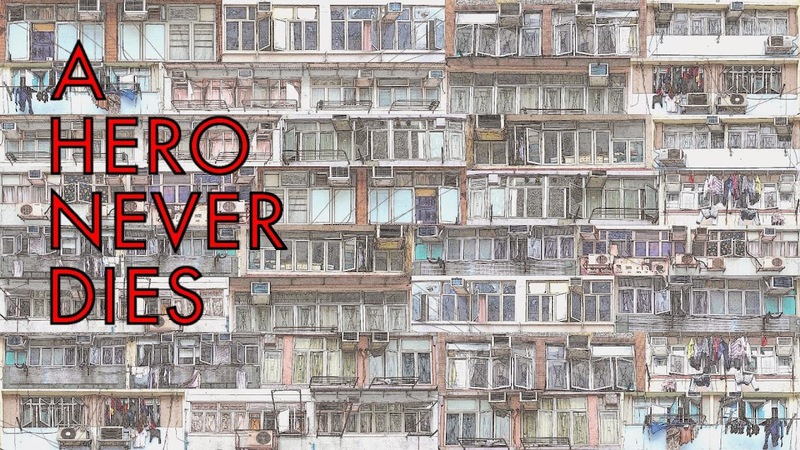 Pang Ho-Cheung's Cat III rom-com based around the back alleyways of Hong Kong, where after the smoking ban in public buildings came into effect HK workers congregate and share stories with each other while taking their smoke breaks. A very slight but diverting and entertaining story, with really good performances from Shawn Yue and Miriam Yeung. While watching Love in a puff I felt as though I was missing out on some of the funny, feeling that the subtitle translation was not doing the Cantonese swearing justice, can any Cantonese speakers confirm if this is true or not? Takeshi Kitano's latest film is a return to the gangster genre that at least in the west he made his name with. An almost Shakespearean tale of political double crossing and back stabbing between different factions of yakuza, where they use increasingly inventive and nasty ways of maiming and killing each other. 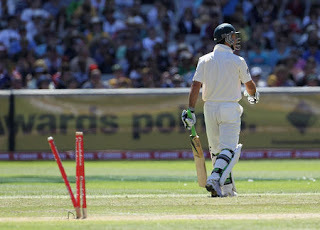 The film is very straightforward and is almost a series of set pieces without a narrative, but this works in the films favour, the strength of it being in its execution, it is very lean and very mean with not a single frame wasted. While Outrage is not as good a film as Sonatine or Hana-Bi it is a welcome return for Kitano to the genre. It also has the nastiest use of dental equipment I have seen for a long time. Johnnie To and Wai Ka Fai's new film Don't go breaking my heart to be released in 2011, as much of a Milkyway fanboy as I am, I'm not sure about this one, maybe it is the title that makes me think Elton John and Kiki Dee. I like most of the rom-coms and dramas from Milkyway image, although I haven't been able to make myself watch Linger yet. The fact that Wai Ka Fai is involved should mean it will at least be interesting, but we'll see, what does everyone else think? Credit to Filmsmash for the poster and trailer. 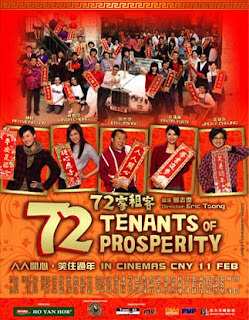 72 tenants of prosperity is a 2010 updating of the old Shaw brothers film The house of 72 tenants and was made for a lucrative Chinese new year slot in cinemas, as a result you should know going in what kind of film to expect. 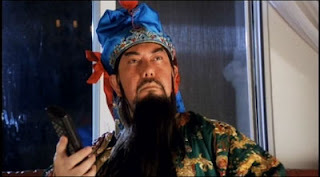 Made by a team of writers, co-directed by three people including Eric Tsang and produced by no fewer than five companies including Shaw brothers, TVB and UFO. The film opens with a sequence set in 1970's Hong Kong introducing our main characters Ha Kung (Justin Lo and Eric Tsang), Shek Kin (Raymond Lam and Jacky Cheung) and Pinky (Fala Chen and Anita Yuen). 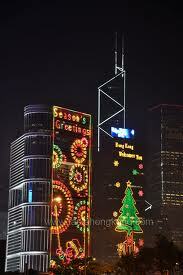 We then move to 2010 and Sai Yeung Choi Street in Mongkok where the friends turned enemies Ha Kung and Shek Kin run competing mobile phone shops, they fell out over the love of Pinky when Ha Kung won the hand in marriage of Pinky on a coin toss, something that Shek Kin has never been able to get over. The bitter rivals forbid their families and workers from fraternizing with their opposites and employ ever more crazy schemes and dirty tricks to out do each other, but while fighting each other the tenants receive notice of crippling rent rises, will this force the tenants of Sai Yeung Choi to close up for good leaving the shady mainland property developers to move in? As this is a new year film while the main storyline is going on it will be no surprise to you that family members from each side fall for each other, things come to a head between Ha Kung,Shek Kin and Pinky and that the traders join forces and work together to try to keep their livelihoods safe. Do all these plot strands have a happy ending? As I said this is a new year film. It is slightly more than that though in that it does work social issues into the plot and even uses the mongkok acid thrower as a plot point. Jacky Cheung and Anita Yuen are really good, Eric Tsang is Eric Tsang which is a good thing and I particularly enjoyed Justin Lo as the younger Eric Tsang with his impression making me laugh out loud when he speaks. 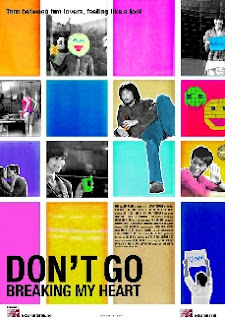 Some of the TVB stars featured seem out of their depth in a film, but this does not really hurt the movie too much. What could be harmful to your enjoyment of 72 tenants is your tolerance for product placement, as I have not seen such blatant examples since the last two James Bond movies, it is so bad in this that they even make a joke of it at the end. 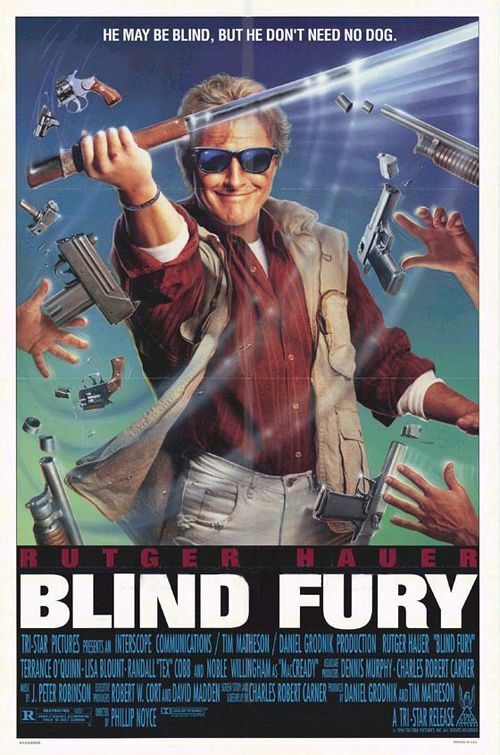 Going into this film I had pretty low expectations, I was expecting fluff and it is really but I found it to be entertaining fluff, the movie pretty much gets by on the cast being fun to watch, so if you don't like the actors you won't like the film. It is great to see Anita Yuen back on screen again in a comedy she really does have natural charm. Lam Suet also has a tiny but very funny cameo. One of the best things about it is that it feels like the team behind it set out to make a film for Hong Kong audiences and not worry about anyone else, which in these days of HK movies trying to be Hollywood like or pandering to mainland Chinese audiences and censors, is a refreshing change. 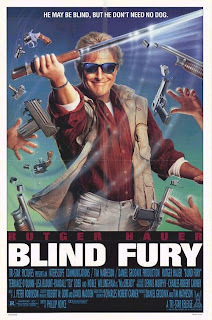 I saw the film on Blu ray and the image was surprisingly good, with excellent detail. Sound was fine. 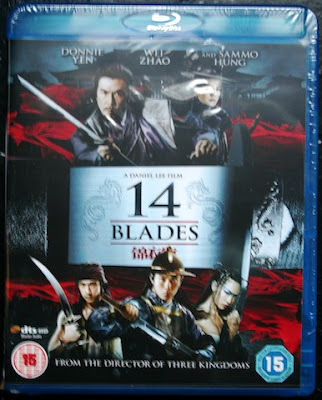 The dvd would be sufficient for most people but the shots of Sai Yeung Choi street look fantastic and are worth having the blu for alone for me as I love Mongkok. Not sure what happened with the font on this one,sorry! 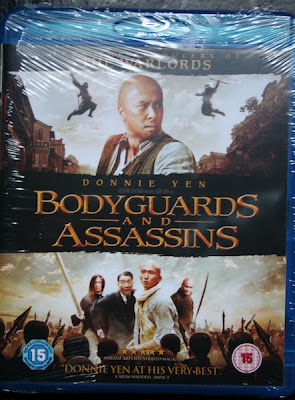 UK blu ray release of Teddy Chan's imperfect but very entertaining Bodyguards and assassins, I know lots of people had problems with the film but I really enjoyed it and the blu ray itself looks fantastic. 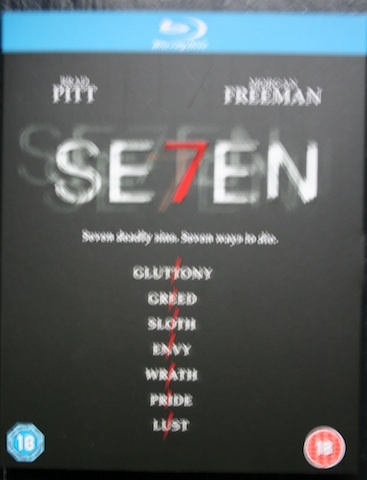 David Fincher's Seven on blu ray, upgrade from the dvd that I never actually watched all the way through (its Seven, you have to be in the mood) but it is time for a rewatch and this blu has an amazing transfer and is a massive improvement over the already impressive dvd. 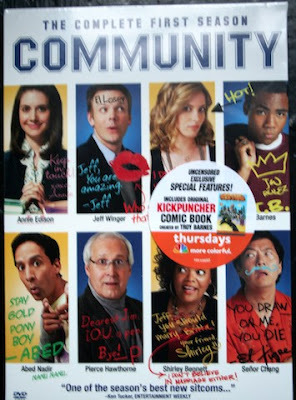 Season one of the funniest show on tv Community, excellent box set of all the episodes with some nice extras and a cast and crew commentary on every episode, if you haven't given this show a try you need to! UK blu ray of Daniel Lee's 14 Blades, heard some pretty negative things about this but wanted to see it for the action and picked it up for not too much. 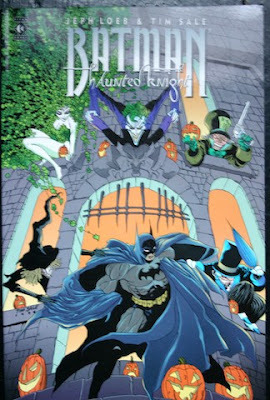 Batman The haunted knight by Jeph Loeb and Tim Sale, a collection of short Batman stories that features one of my favourite ever Batman shorts. Loads more to come including the new limited edition Battle Royale blu ray set which I cannot wait for. My new toy was delivered today, so far I have only opened it, need more time to actually try it out. Its an LG 2TB NAS with Blu ray writer, the two 1TB hard drives are hot swappable and can be configured in multiple ways. My first impressions of the unit are very good, it seems to be very well built and its quite easy on the eye, obviously the actual set up and use of the device will be the real test. Made in 2000, Dante Lam's Jiang Hu-The triad zone is one of the most ambitious and original gangster films Hong Kong has produced, it takes many of the triad film cliches and reworks them into something fresh and funny. Tony Leung Kar Fai plays a triad leader who finds out that a hit is planned on his life sometime in the next 24 hours, he spends this time trying to find out who has ordered the hit to strike first against his enemy, but finds himself spending more time re-evaluating his life and the people in it. The most prominent of these people is his long suffering wife played by Sandra Ng. I find it incredible that Sandra Ng did not get a nomination at the Hong Kong film awards for this, she is fantastic in the role and while I think Maggie Cheung deserved the award for In the mood for love, Sandra could and should have had two nominations as she was also amazing in Wilson Yip's Juliet in love in the same year, maybe the voting was split between the two films and that went against her. I have singled out Sandra Ng here but all the cast is extremely good with great turns from Tony Leung, Roy Cheung as the bodyguard and Anthony Wong in an hilarious cameo. The film is very funny,it is quite serious but not completely, it has parody elements but is not a parody and most importantly, unlike many Hong Kong films, where the tone can be all over the place this is pretty consistent throughout mixing the drama with the comedy in a way that feels kind of unique. Unfortunately since Beast cops and this film Dante Lam has been quite disappointing, I was hoping he would kick on and make more interesting and ambitious films and while I liked Beast stalker, everything else I have seen has been disappointing, especially the terribly dull Fire of conscience. The Mei Ah dvd is very disappointing being released before anamorphic dvds were common, the image is quite washed out with lots of damage and the sound has a lot of hiss, this film deserves much better and is a title crying out for a remaster, a French dvd is available and is 16:9 enhanced but does not have English subtitles. On the Video nasties : The definitive guide dvd set that came out recently in the UK is Jake West's documentary Video nasties Moral panic,censorship and videotape, a seventy minute look at the whole sorry mess. It features many of the main players involved including the MP Sir Graham Bright (responsible for the video recordings act bill) who would have been hilarious if he hadn't had a say in running the country. You really have to see to believe the part where he talks of the research being done that will prove that not only do violent videos harm children but dogs too! I kid you not. UK filmmakers including Neil Marshall and Chris Smith are featured reminiscing about watching video nasties when they were kids and how the nasties influenced their work and respected critics Kim Newman and Alan Jones are also featured. On a more serious note the film goes into political territory explaining the state of the country at that time and how the government needed something to deflect the growing unrest, that thing was violent videos and with the help of the right wing media a campaign of misinformation and outright lies were launched which somehow whipped up such a frenzy that all common sense went down the toilet. If you know the history of the nasties you will probably not learn anything new but it is such a fascinating subject that it is worth watching anyway but if you are new to nasties watch this, enjoy and then seek out the books on the subject Seduction of the gullible and See no evil. Amer is told in three segments all focusing on different moments in Ana's life, one as a child, one as a teenager and one as an adult. Told almost without dialogue it is about how psychologically affected we can be by our early experiences and the damage that they can cause in later life, but to talk about the story is really missing the point of the film, it is really not about the story so much as the film making technique used to create it, not so much a case of style over substance but more the style is the substance. 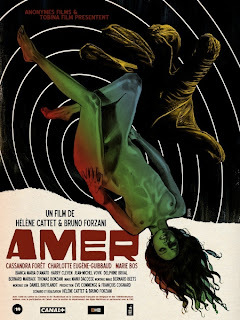 A huge buzz has formed around Amer due to suggestions that it was the return of the giallo genre, the stylish murder mystery films of the late sixties and seventies the Italians made so well. It is not a giallo film, however it is so infused with the iconography of the genre that it is easy to see why it looked like a giallo. The film steals all the familiar tropes from the gialli of Argento et al, there are great uses of colour gels which bring Mario Bava to mind. Brian De Palma is also referenced and even Sergio Leone is in there, with some incredibly dramatic close ups of eyes he would have been proud of. 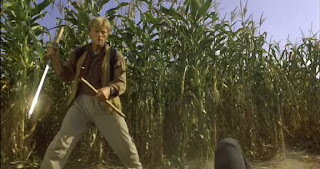 Camera angles and editing are used to great effect and the soundtrack is completely made up of cues lifted from giallo films and this all reinforces the mood and tone of the film, one Ennio Morricone piece I was unfamiliar with was a particular highlight for me. The sound design is fantastic, with every sound heightened whether it be leather glove creasing or someone flicking a comb , it sounds great and adds unease to almost every scene. Amer will not be enjoyed by everyone as it is an art film more than the genre piece many were expecting, some may find the style irritating, maybe the story slight and confusing but if you have any interest in seeing the film track it down, it is intelligent, unconventional, visceral, very sensual and ultimately very satisfying. Finally got around to watching this, if you haven't seen it yet don't wait any longer, get it now. Pang Ho Cheung manages to pull off a mixture of intelligence and silliness brilliantly to create one of the funniest Hong Kong movies I have seen. The cast is fantastic, with Eric Tsang, Jordan Chan and Chapman To leading the way but the film is owned by the cameos from Tony Leung Kar Fai and Sandra Ng who are both hilarious in their small roles. 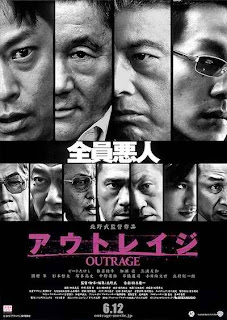 The film is full of movie references with scenes lifted wholesale from Infernal affairs and there is an inspired tribute to John Woo and heroic bloodshed movies. After what seems like forever since the last Milkyway film comes a poster for the Johnnie To produced, Soi Cheang directed Motorway which stars Anthony Wong and Shawn Yue. 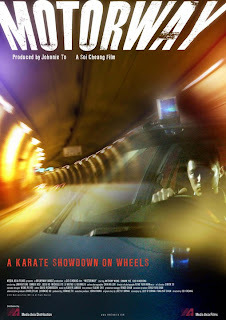 A karate showdown on wheels, sounds like it could be awesome.